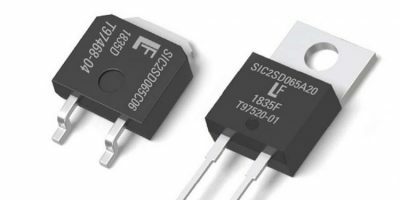 Two second-generation series of 650V, AEC-Q101-qualified silicon carbide (SiC) Schottky diodes are now available from Littelfuse. The LSIC2SD065CxxA and LSIC2SD065AxxA series SiC Schottky diodes offer a choice of current ratings (6.0, 8.0, 10, 16 or 20A). Power electronics system designers can use the diodes’ negligible reverse recovery current, high surge capability, and a maximum operating junction temperature of 175 degrees C, for applications that require enhanced efficiency, reliability, and thermal management, advises Littelfuse. When compared to standard silicon PN-junction diodes, the 650V series SiC Schottky diodes support dramatic reductions in switching losses and substantial increases in the efficiency and robustness of a power electronics system. They dissipate less energy and can operate at higher junction temperatures than Si-based solutions, explains Littelfuse to allow for smaller heatsinks and a smaller system footprint. This provides end-users with all the advantages of more compact, energy-efficient systems and the potential for a lower total cost of ownership, says the company. Typical applications for 650V LSIC2SD065CxxA and LSIC2SD065AxxA series SiC Schottky diodes include power factor correction (PFC), buck/boost stages in DC/DC converters, free-wheeling diodes in inverter stages, high-frequency output rectification and electric vehicle (EV) applications. The 650V series SiC Schottky diodes offer lower switching losses than silicon bipolar diodes and fast, temperature-independent switching behaviour, making them suitable for high-frequency power switching. The positive temperature co-efficient enables safe operation and ease of paralleling, while the 175 degrees C maximum operating junction temperature provides a larger design margin and relaxed thermal management requirements, claims the company. The LSIC2SD065CxxA series SiC Schottky diodes are available in TO-252-2L (DPAK) packages, in tape and reel format. The LSIC2SD065AxxA series SiC Schottky diodes are available in TO-220-2L packages.